News about gross domestic product or GDP affects the stock market differently than anticipated GDP. This is because news impacts market psychology differently than fundamental economic data. According to a study published in the Journal of Finance, media does influence short-term investment patterns prior to adjusting to other influences such as actual asset worth. In particular this is noted to occur when news is pessimistic. However, other studies indicate this is not necessarily always the case. If economic forecasts are inaccurate, then the efficient pricing of market instruments such as stocks is more likely to have led to an overvaluation of share prices than had the predictions been correct. In such case, news of GDP performance that does not reflect market expectations is more probable to have an impact on the stock market. For example, in the fourth quarter of 2012 it was widely believed the U.S. economy would grow. When the Bureau of Economic Analysis reported GDP unexpectedly turned negative, stock markets around the world immediately reacted negatively. Investor decision making or heuristics is also a relevant factor to how news of GDP affects the stock market. More specifically, cognitive processes detailed in the Financial Services Review reflect an bias in investor reasoning. Moreover, investors' financial reasoning is overestimated in their own eyes in addition to not being able to match GDP performance as a group. This also corroborates a BNY Mellon Asset Management report that states multiple factors, not just GDP, affect stock prices. Statistical tests also show any impact of GDP news is short lived. 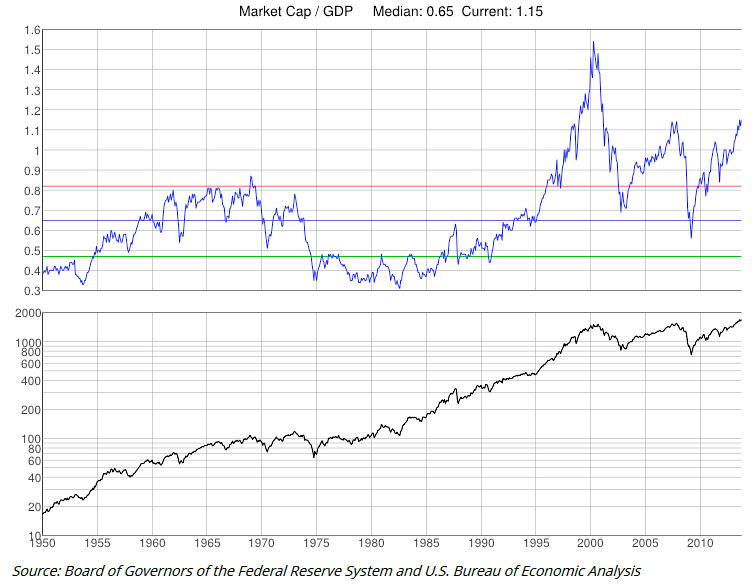 Specifically, over a five-year period stock markets do not produce a substantial correlation with GDP. This is evident in results portrayed in The Economist that found in both developed and emerging markets, medium-term market performance did not gainfully match countries' GDP growth. The reasons given for these finding include the stock market being a measure of corporate performance more than economic growth, and that growth is reflected in stock prices before that growth is realized. The aforementioned statistical findings are further supported by additional research about the relationship between GDP and stock prices is discussed in the Pacific-Basin Finance Journal. Furthermore, in one study not only was there no positive between GDP and stock prices, but the correlation that did exist was negative. In other words, economic growth resulted in lower priced shares. The reason this research gives is that corporate dividends do not necessarily rise after GDP rises, and that share prices only go up if efficient valuation of economic performance has not already taken place. Another reason why GDP, in addition to news of GDP do not necessarily influence stock prices to a statistically significant level is because aggregate market behavior is not necessarily conducive to it. Moreover, according to research cited by Zero Hedge, investors do not always reinvest their investment income and if they sought to realize capital gains or profits from investments, the result would also under-reflect GDP growth. Thus, in both cases stock prices cannot reflect GDP growth due to this apparent 'catch-22'. Substantial evidence exists to show over the long-term, GDP does not affect the stock market to the point of statistical correlation. This is not to say, news about GDP has not immediate affect on prices. Rather, what studies have shown is that multiple factors influence investor decisions, and these variables are not always conducive to a simultaneous pricing in of GDP news or data in share prices. This is partially explained by the efficient market hypothesis that points to an early pricing of expected GDP growth rather than directly after news of it. Additional explanations include patterns in financial reasoning and market behavior that at times, supersedes the affect of GDP news.